Available in 2-door hatch and convertible body styles, the Beetle trades practicality for style. It loses some performance due to reduced torque from the 1.8-liter turbo engine, churning out 170hp and 184 lb-ft. Front wheel drive is the standard on all models, and the only gearbox available is a 6-speed dual clutch automatic. A Dune model offers raised ride height, model specific bumpers, and buggy-influenced styling, plus 18-inch alloy wheels. Safety features available on the Beetle include a rear-view camera, blind spot assist, rear cross traffic alert, and park distance control. Where would Volkswagen be without the Beetle? Hell, where would Porsche be without the car that the 911 derived its rear-engined layout from? But nearly 8- years on from the original VW Type 1, the 2017 Volkswagen Beetle shares little more than a passing visual resemblance to its great grandfather. That’s not to say the essence of the Beetle has been lost, but based on the MQB platform, the Beetle is now more closely related to the Golf than it is to a Porsche 911. But with the available convertible and 5 trim levels, the Beetle might be the definitive style-orientated compact hatch. Unlike the Golf – the epitome of ergonomics and clever packaging – the Beetle trades practicality in for style. Though the 2 front occupants will have no real gripes, rear passengers will struggle with cramped head room and difficult ingress and egress. It’s not that the door apertures aren’t large enough – they are – but because the doors are so long, it’s difficult to open them properly in parking lots. But hoisting yourself forward is easy enough thanks to B-pillar mounted grab handles. Visibility is compromised due to chunky design elements and a small rear windscreen. In terms of finishes, they’re high quality, but some dash finishes can feel a bit plastic. The retro design centers around a 3-gauge instrument cluster and a standard 5-inch touch screen infotainment setup. The system works well, but you have to choose a higher spec variant to get a larger, easier to use system. The Beetle exhibits a heaviness in its ride and steering that doesn’t feel akin to its compact visual appearance. It inherits its hardware directly from the Golf, which means the electric power assisted steering is accurate, if not the most feelsome. Ride comfort is premium though, even more so with the Dune’s raised ride height. Body control is taught in hatchback models, though the convertible displays some softness due to the reduced body rigidity. R-Line equipped Beetles ride firmly compared to standard models, due to stiffer sports suspension – unnecessarily so in fact – which reduces the body roll you’ll find in regular models. Surprisingly, the Beetle suffers from sub-standard brake feel – despite the Golf underpinnings. Initial pedal feel is soft, making it awkward to transition into smooth braking maneuvers, and you end up needing more force than required. When needed though, the braking power is sufficiently potent. In all models, you’ll find a 1.8-liter turbocharged 4-cylinder engine – the same as the Golf – with outputs of 170 horsepower, but reduced torque at just 184 lb-ft. Volkswagen has dropped the 2.0-liter turbo in the R-Line, which now also gets the 1.8T. Unlike the Golf that offers a manual option, the Beetle makes do with a solitary gearbox choice – a 6-speed dual-clutch automatic – though there is a manual function equipped. Hatch and convertible models get EPA rated consumption figures of 24/33mpg city/highway, with the Dune dropping to 31mpg on the highway. 6 trim lines are available, including the order-only R-line trim on the hatch. Equipment varies, but standard across the range you’ll get a rear-view camera, automatic headlights, and Bluetooth connectivity. The SE model adds leatherette seating and keyless entry, while the SEL adds a panoramic sunroof. Full media connectivity is only available in the Classic trim which unfortunately gets a bit pricy. Safety options include blind spot assist, rear cross traffic alert, and a park pilot assistant. 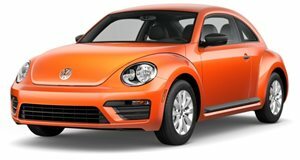 The NHTSA rated the Beetle 5 stars out of 5, while the IIHS rated the Beetle a top score of ‘Good’ in all tests except the small front overlap test where it scored Marginal ratings. 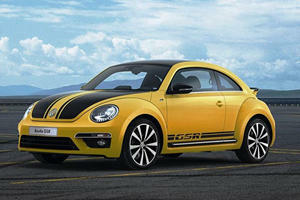 Considering it shares almost all hardware with the Golf, the Beetle is a compromised style-orientated proposition. It’s no longer a Beetle of old, but for the singleton with no family aspirations, the convertible will make a fun runaround. The Golf is where logic dictates your money should go. His original defense: he was merely following orders. 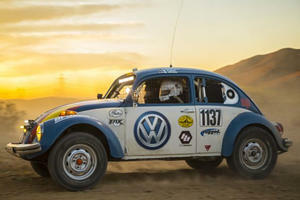 Looks like the Volkswagen Beetle may not be ready to die just yet.